How to change the look of firefox! 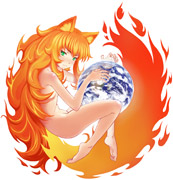 Firefox is the being used by the majority of the internet users. For me, Firefox has been the most comfortable and convenient web browsers since 2004. And since I’m staring to it all day, And I assume lots of you do. Then the look of it really matter. I’ll just talk about few ways on how to change the look of it. If you’re using Firefox 3.6 or higher then this option is the easiest and the most simple way. Just go to GetPersonas.com and hover the mouse over the Persona you like, and it will auto preview itself! If you like it, Click on “Wear it!” And you’re done. This option is available for all versions of firefox. Go to https://addons.mozilla.org/en-US/firefox/browse/type:2/ Browse the themes, Pick the one you like and add it to your firefox. Like we all know, Firefox is a free and an open source application, So everything in it is tweakable and changeable. CSS stands for Cascading Style Sheets, Which enables you to change the look of how things appears. If you have absolutely no idea about CSS you may want to skip this part. You should find 2 CSS files in this folder, Rename the file userChrome-example.css to userChrome.css and open it. Now you’re free to add all the CSS rules that you want. Make font bigger, change the background color or image, Hide menus, You name it! When you finish editing the file, Start firefox again and you’ll see that all the changes have been applied. That’s it for now, Hope you like it. Great info, I never knew about the personas before.